These vitamins are good for reptiles. This vitamin preparation for reptiles has been enriched with essential vitamins, trace elements and amino acids like colour enhancing beta-carotene and vitamin D3. For an optimum result, animal fodder, vegetables and fruit have to be sprinkled with this preparation three times per week before feeding. This vitamin preparation contains calcium and vitamin D3 and is also enriched with essential vitamins, trace elements and amino acids like the colour enhancing beta-carotene. For an optimum result, animal fodder, vegetables and fruit have to be sprinkled with this preparation three times per week before feeding. 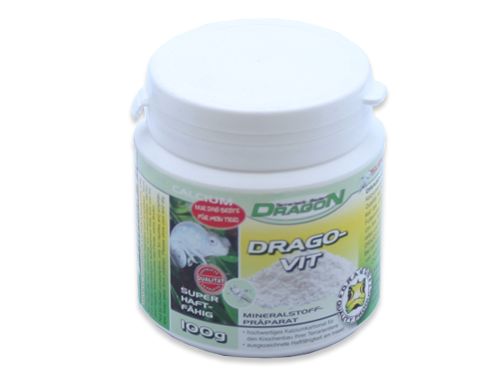 Drago-vit calcium is a preparation that can be best used while rearing and keeping terrarium animals in a good and healthy shape. It exists for 99% of pure calcium carbonate. Also for pregnant females it is an essential product: it will be beneficial to the built up of bones and the quality of the eggshells. Drago-vit calcium can easily be added to animal fodder, vegetables and fruit. We advise you to combine Drago-vit calcium with Drago-vit multi vitamin, to ensure your animals receive a sufficient amount of trace elements and amino acids.